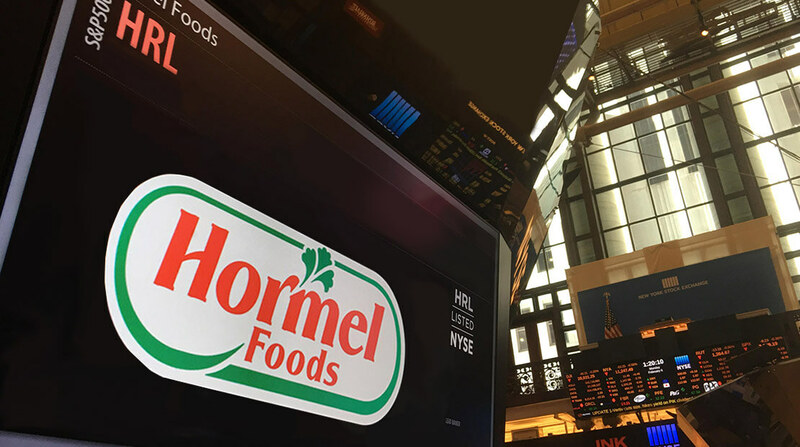 Hormel Foods Corporation (NYSE: HRL) today reported record performance for the fiscal year 2015 third quarter. All comparisons are to the third quarter of fiscal 2014. • Record diluted EPS of $0.54; non-GAAP1 diluted EPS of $0.56 excluding Applegate Farms, LLC (“Applegate”) transaction costs of $8.6 million or $0.02 per share. • 2015 non-GAAP1 adjusted earnings guidance range increased to $2.57 to $2.63 per share2, includes neutral full year impact of Applegate acquisition. • Record volume sales, up 3 percent; dollar sales of $2.2 billion, down 4 percent. • Refrigerated Foods segment operating profit up 9 percent (including Applegate transaction costs of $8.6 million); volume up 2 percent; dollar sales down 11 percent. • Jennie-O Turkey Store segment operating profit down 45 percent; volume down 16 percent; dollar sales down 12 percent. Decreases reflect the substantial impact of the avian influenza outbreak earlier this year. • Grocery Products segment operating profit up 57 percent; volume up 10 percent; dollar sales up 8 percent. Excluding incremental net sales of MegaMex Foods products, volume and dollar sales flat. • Specialty Foods segment operating profit up 79 percent; volume up 26 percent; dollar sales up 31 percent. Excluding incremental sales of CytoSport Holdings, Inc. (“CytoSport”) products, volume up 1 percent and dollar sales down 7 percent. • International & Other segment operating profit up 3 percent; volume down 4 percent; dollar sales down 6 percent. On a GAAP basis, the company reported fiscal 2015 third quarter net earnings of $146.9 million, up 6 percent from net earnings of $138.0 million a year earlier. Diluted earnings per share for the quarter were $0.54 this year compared to $0.51 per share last year. Excluding Applegate transaction costs, the company reported fiscal 2015 third quarter non-GAAP1 net earnings of $152.5, up 11 percent from net earnings of $138.0 million a year earlier. Non-GAAP1 diluted earnings per share for the quarter were $0.56, up 10 percent compared to $0.51 per share last year. Sales for the quarter were $2.2 billion, down 4 percent from the same period in fiscal 2014. “Our balanced business model prevailed once again this quarter, as we were able to overcome the significant challenge of avian influenza in our Jennie-O Turkey Store segment to deliver record earnings and volume sales,” said Jeffrey M. Ettinger, chairman of the board, president and chief executive officer. “Grocery Products drove earnings growth with favorable input costs and increased sales of HORMEL® chili and SKIPPY® peanut butter. Specialty Foods also delivered excellent results, as the team continues to increase sales of MUSCLE MILK® protein nutrition products, and improve the cost structure and synergies between our CytoSport and Century Foods businesses. Revenues were down for the quarter, impacted by lower pricing due to declining pork markets affecting our Refrigerated Foods and International segments, and the loss of sales related to avian influenza in the Jennie-O Turkey Store segment. Hormel Foods Raises Profit Outlook Hormel Foods raised its earnings outlook for the year. Hormel CEO sees fall as ‘wild card’ because of bird flu Hormel Foods Corp.’s second-quarter profits topped Wall Street’s expectations, and its stock jumped 4 percent Wednesday.